PAD-CAR Mechanical Ltd. was established in 1985 as a labor subcontractor to Snyder and Boon on the Medicine Hat Hospital Addition. In 1990 PAD-CAR began offering full Mechanical Contracting services and has continued for more than a decade to provide quality commercial construction installations. In 1998 PAD-CAR Mechanical began offering design engineering and drafting services for in house design build projects. In 2002 PAD-CAR Mechanical began offering in house sheet metal fabrication and installation services. PAD-CAR Mechanical is a leading mechanical contractor in plumbing and heating design and installations. We specialize in commercial, light industrial, institutional and residential services of all size. 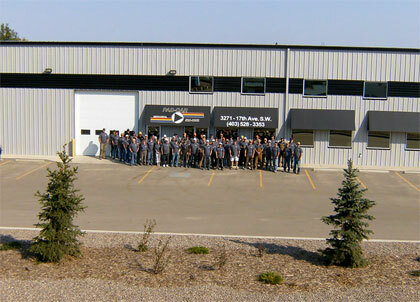 Located in Medicine Hat, Alberta, Canada, we offer one stop in-house design engineering, plumbing, steam fitting, gas fitting and sheet metal installations. PAD-CAR specializes in hydronic heating and ventilation based system designs and installations. As a certified York dealer we offer a full product line of commercial and residential ventilation equipment to competitively meet any size project. We have experienced installers and service personnel for all aspects of mechanical equipment including boilers, pumps, hot water systems, radiant heaters, furnaces, condensing units, roof-top units, air handling units, heat recovery ventilators, make-up air and exhaust systems, chillers and evaporative coolers. With a history of strong engineering expertise and commitment to product quality and innovation, PAD-CAR enjoys an excellent reputation as a reliable construction and design solutions organization. Our commitment to quality engineering standards and practices in our end product has enabled us to focus on all of our customers' needs. PAD-CAR strives to offer the most effective design and construction solutions and to be one of the industry's leaders. PAD-CAR continually seeks new product opportunities to enhance the value we add to each one of our customers. As a fully bonded contractor and registered member of the Mechanical Contractors Association we urge you to make sure you choose your mechanical contractor wisely and put us to the test on your next project.